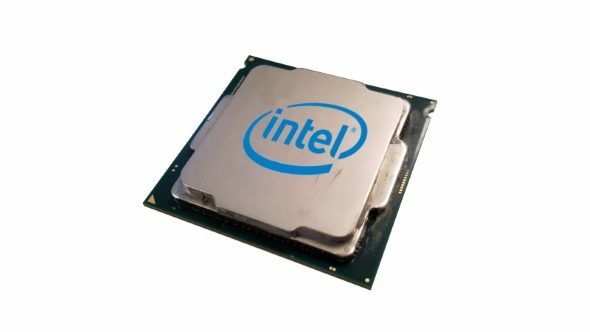 July 26, 2018 This article was updated due to fresh reports of Intel soldering the heatspreader on its upcoming Core i9 9900K and Core i7 9700K CPUs. Adding more fuel to the fire – or lack thereof, in fact – multiple sources close to Intel have told tech site Golem that the company will be attaching the heatspreader directly onto the latest Intel Coffee Lake eight-core chips, the i9 9900K and i7 9700K, with solder. Intel had all but given up on directly soldering heatspreaders onto chips, instead opting to use a rather disappointing TIM (thermal interface material) on all of its mainstream processors since the Sandy Bridge architecture. Even the last HEDT generation, Skylake X, favoured TIM over solder. 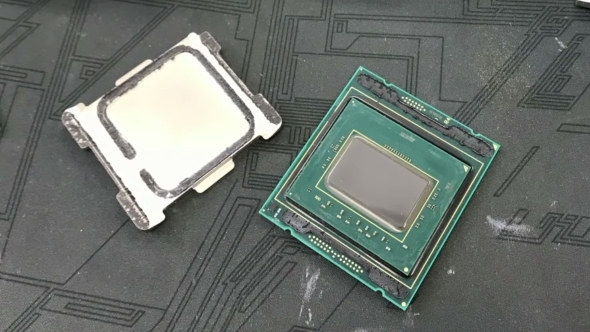 Soldering is often seen as far more preferable method of transferring heat from processor die to heatspreader, and eventually away into your CPU cooler, and it’s starting to look quite likely that Intel’s top enthusiast Coffee Lake chips will return to the effective method. AMD’s Ryzen chips are all soldered, and it might be that Intel is feeling the competition heating up (figuratively) and needs to cool things down (literally) with a more effective thermal transfer method itself. 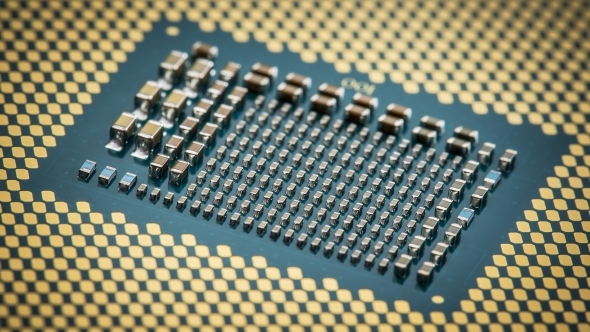 Intel was first suspected of utilising solder on its latest chips after a source from the German tech trade leaked that Intel has an NDA expiring on 1 August – with suggestions that this could well be linked to the announcement of its new processors, including the Intel Core i9. The same report is also claiming, as does the latest report from Golem, that these new chips will come with soldered heatspreaders instead of the lightweight thermal interface material (TIM) recent Intel chips have used. This should help manage the temperatures of the higher-clocked CPUs and will also help with achieving higher overclocked frequencies too. There is anecdotal evidence of a six-core engineering sample hitting 5.5GHz. It’s recognised by CPU-Z as a Core i7 8086K, but not by Windows, and the genuine anniversary chip doesn’t traditionally come with solder. Could this be the Core i7 9700K? The new Intel Coffee Lake refresh will come with a host of new processors, but in reality most of them are little more than 8th Gen chips with a slight clockspeed bump. But if the K-series CPUs in the new range do come with soldered heatspreaders that will be a real reason for gamers and enthusiasts to spend their cash on a new 9000-series chip. There’s no confirmation yet as to whether this will be the same with the expected Intel i9 eight-core CPU, but given that it’s expected to feature as a K-series too that seems likely. Something else that would be encouraging is for Intel not to block backwards compatibility with existing motherboards, which we’re hoping is the reasoning behind MSI’s new BIOS updates for its Z370 boards. The improved thermal design makes sense given that we’re talking about a half generational refresh, rather than a full new generation of Core processors. Back when Intel introduced the Devil’s Canyon range of chips to the Haswell lineup it added a new thermal interface material to them – calling it a Next-Generation Polymer TIM – and that allowed the otherwise only mildly faster CPUs to push past the limits of their Haswell forebears. Doing the same with the 9000-series chips is the best way to ensure there is appetite for them. Despite the 1 August NDA leaked by the German trade source, however, it doesn’t look that’s going to be the official release date of the new processors. The source confirmed that though the NDA expires on the 1st the trade is still not able to order new products from Intel, which would make it more of an announcement date rather than a retail launch. And if Intel is announcing at the start of August it wouldn’t be a stretch to expect some sort of full release by the end of the month. But we’ve heard from Intel that it is not going to be at Gamescom, so it doesn’t seem like there’s going to be a new Nvidia GTX 1180 / Intel i9 pairing coming out of the big German games show.